Hitachi Seaside Park, located in Hitachinaka, Ibaraki prefecture, Japan, next to the Ajigaura Beach, is a flower park and a popular tourist destination. The park covers an area of ​​3.5 hectares and the flowers are amazing all year round. Each season you will find a different variety of flower blossoming over the "Miharashi No Oka", a hill commanding a panoramic view of the Pacific Ocean. The park is particularly famous for blue nemophilas. Nemophilas are annual flowers with transparent blue petals. During spring, more than 4.5 million blue nemophilas bloom all over the park. The blooming period is called “Nemophilia Harmony” and attracts many visitors. Aside from nemophilas, the park has about a million daffodils blooming amidst the pine trees, about 170 varieties of tulips and many other flowers. 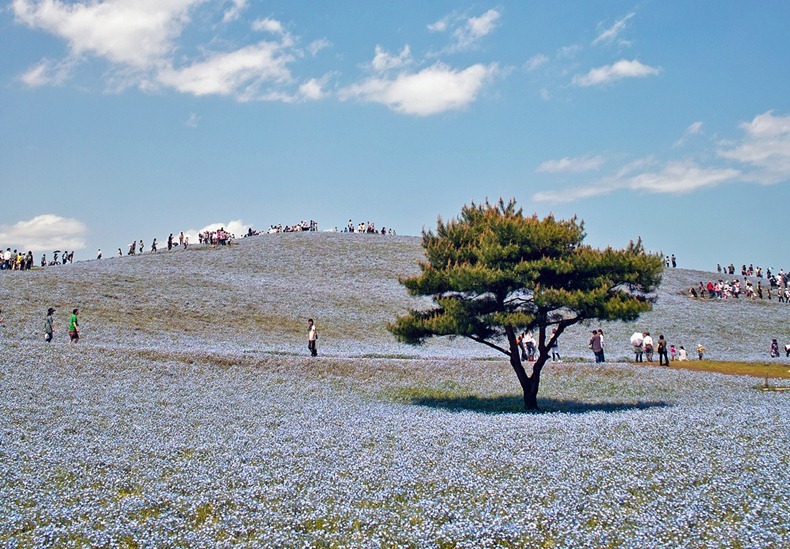 Filled with woods, gardens, a mini amusement area and cycling courses sprinkled throughout the park, Hitachi Seaside Park is a must-see for anyone venturing to Japan.